Many people knew Nipsey Hussle as a rapper who gave back to his community any chance he got, but not many knew just how much he really did to improve the lives of others. When the slain rapper showed up to the Elite game to cheer on the Texas Tech Red Raiders, many assumed he was there to experience some March Madness action, but it goes way deeper than anybody even knew. “As the biggest basketball game of his son’s life tipped off last Saturday afternoon in Anaheim, Texas Tech guard Brandone Francis’ father kept glancing at the empty seat beside him, trying not to lose hope. For Bobby and Brandone Francis, Nipsey Hussle was more than just a world-renowned rapper. He was a cherished family friend whose innovative tracks and generosity with his time helped mend a broken relationship between father and son. Estranged for 13 years while Brandone grew up with his mother in the Dominican Republic and Bobby carved out a career in the U.S. as a brand strategist in the entertainment industry, father and son bonded over a mutual passion for Hussle’s music when they were reunited. Bobby’s relationship with Hussle and role in launching the career of such a legendary rapper gave him newfound credibility with his son. One year after Brandone Francis left the Dominican Republic in search of stronger basketball competition in the United States, the high school sophomore approached his father with a very pressing question. The irony of the question wasn’t the only reason it drew a sly smile from Brandone’s dad. Bobby Francis also recognized he had a chance to do something special for Brandone and perhaps take a small step toward mending their fractured relationship. Hussle would send Brandone video shout-outs on his birthday and text or FaceTime with him sporadically. The rapper would also always ask how Brandone’s basketball season was going anytime he spoke with Bobby. When Texas Tech players spilled onto the floor in celebration at the final buzzer, Hussle patted a teary-eyed Bobby on the back and shouted, “Big Bob, we going to the Final Four!” He later caught Brandone’s attention and yelled across the floor to congratulate him. Bobby Francis was an instrumental part in the early success of Nipsey Hussle which guided him to where he was before his life was tragically taken away from him right in front of the very store he built in his own community. As it turns out, Francis just so happened to be at the Marathon store hours before a cowardly shooter would gun him down in cold blood. 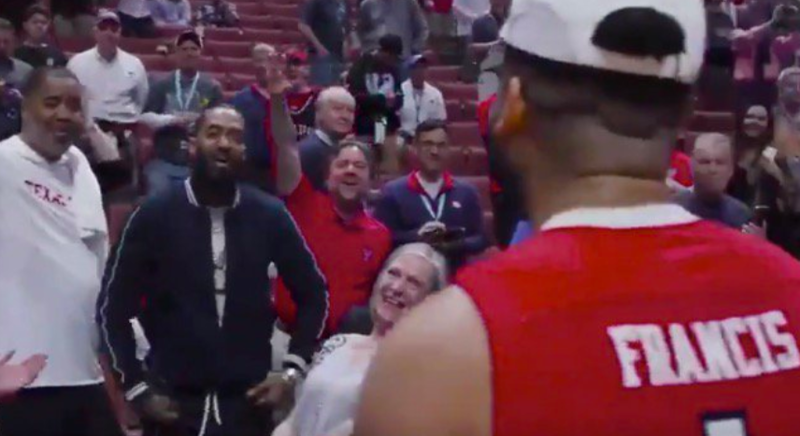 Nipsey had plans to fly to Minnesota to watch the Red Raiders in the Final Four before his untimely demise.